This was written for Nokia PC Suite 6.8. Things seem to have become much easier since then. I regularly use Nokia PC Suite to save my SMS' and to backup other data off my phone using a DKU-5 cable but the first time I had to set it up, I spend quite a frustrated hour trying to figure out how to get it to work. It's not quite as simple as plugging in the phone via the cable since it isn't a USB device and the cable requires a USB-Serial driver. I've got the hang of it now and I thought I should put up a few tips for others so that they can save time and get right to the good stuff. Nokia PC Suite. Available for free on the Nokia site. Pick up a version that'll suit your phone. DKU-5 cable. I'm pretty certain this will work for others also but I haven't actually tried any other cable so can't say for sure. Windows 98/2000/Me/NT/XP. I've installed this on Windows 98 and XP. But since the others are kinda in between these two flavours, should work. You may need a cable driver for your cable. I didn't have to install one, I think it comes bundled with the newer versions of PC Suite, atleast, while installing, one of the components was a Connectivity Cable Driver. NOTE:Do NOT connect your cable or phone to the computer till specifically asked to do so! The installation is pretty straight forward. Just follow the steps given below and you'll be fine. Click the 'I accept...' radio button and then click 'Next'. Select the destination folder where you want to install PC Suite. Click 'OK'. Confirm the path and click 'Install'. Various components will be installed. On successful installation, you'll get the screen shown below. Click 'Finish'. The 'Get Connected' Wizard will start. 'Cancel' it. The PC Suite window should come up. You can close it for now. In your system tray you shold see the icons for PC Suite ( the phone icon ) and for the Synchronize utility ( the circle ). You can turn off Synchronize if you want; I keep it off because I never use it and because anything that starts when Windows does adds to your boot time. 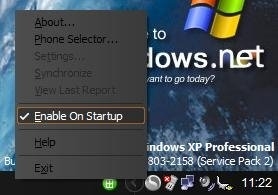 Right-click on the icon and click 'Enable On Startup' to uncheck it. PC Suite has been installed but you can't use it just yet. You need to install drivers for your cable ( if you're using one, that is. If not, you'll need to configure it with IR, Bluetooth or whatever else it is that you're using ). Don't connect your phone or cable yet. You'll get a screen asking you to wait while the installation prepares itself. Click 'Next' on the 'Welcome' screen. You won't get any options for this installer. It'll finish installing and you'll get the success screen. Click 'Finish'. This is where you connect your cable to the computer. BUT do NOT conect the phone at this time. Just plug in the cable without the phone. You will get a pop-up bubble in your system tray saying that new hardware has been found ( USB-Serial Controller ). I'm not sure if you need to, but I disconnect my cable at this point before connecting with my phone. Click the option marked 'Manage Connections'. With 'Serial cable' highlighted, click the 'Configure' button ( or just double click 'Serial cable' ). A dialog box will open asking you to select the serial port to use. 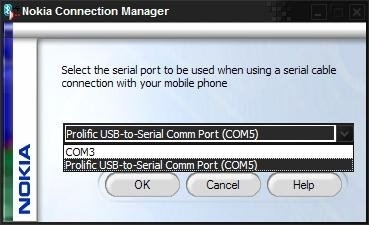 You have to select one named ' Prolific USB-to-Serial Comm port (COMx)' where 'x' is a number, possibly 4 or 5. Click 'OK' on this dialog box and 'Close' on the 'Connection Manager' screen. NOTE: The COM port will change if you connect the cable to a different USB port the next time. You'll have to follow these steps again to select the correct port. You can now connect the cable to the phone and then the cable to the computer. Wait for sometime, usually about 30 seconds or so, for PC Suite to detect the phone. You'll get a popup bubble indicating your phone was detected. The PC Suite window will also reflect that your phone is connected. You can now use the 'File Manager' to navigate to your Inbox or gallery or any other folders that show up, depending on your phone model, and copy paste to it. Keep in mind, however, you cannot paste to the Inbox nor can you copy copyrighted material from your phone; like wallpapers or ringtones that were bundled with it. In case, your phone is not getting detected, read on. If it worked, then that's it. You're done. Go ahead, experiment with your phone and PC Suite. First, make sure you've followed all the four steps listed above properly. If that doesn't work, try the steps below. On the PC Suite window, click 'Get Connected'. The 'Get Connected Wizard' will open. Click 'Next'. Assuming you're using a cable, select the 'Cable connection' radio button. Click 'Next'. Follow the instructions; connect your cable and phone and then the cable to the computer; make sure your phone isn't security locked. Wait for a while, the phone should get detected now. If it still doesn't work, try unplugging the cable from the computer and phone and then connect them again. I've noticed that I need to connect the cable to the phone first and then to the computer. You should try the same order too. If you still have a problem, try reinstalling and following all the steps listed above. Try it on another computer and with another phone to make sure there isn't a problem with either your phone or your cable.